Teddy Bears by Karin Jehle from Lovable Fellows, page 5. 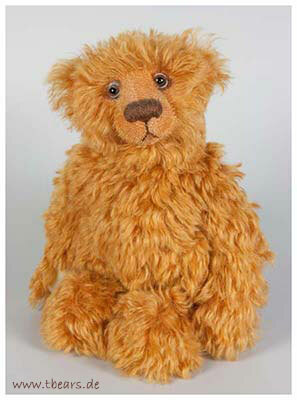 Teddy bear Julio is 40 cm (16 inches) tall. 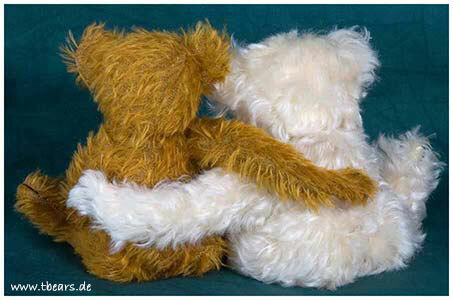 He is made from a wonderful gold-blond German Schulte Mohair. 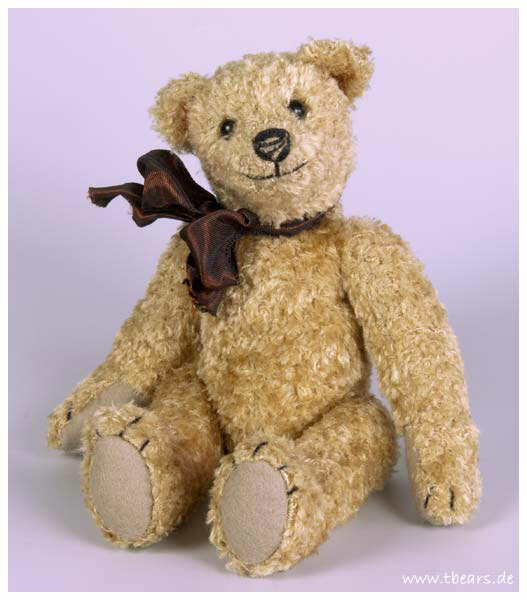 He has genuine victorian shoe button eyes and suede paws. Julio has a growler. 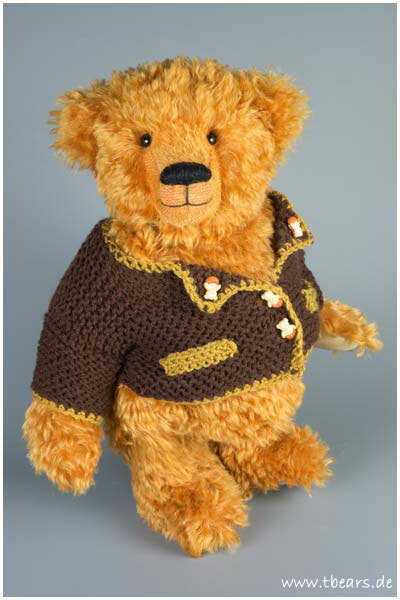 The bear is filled with sheep's wool and he wears a hand-knitted cardigan with two knitted-in pockets. Jodie is completely different from my other designs. Her head is made from 6 pieces (without the ears)! She has fluffy-puffy cheeks. Her face has soft brown shadings to enhance her cute face. Her blue painted eyes with iris are irrestible. Jodie is 11.8 inches (30 cm) tall and made from antique rose long pile German Schulte Mohair with a brown backing. Her paws are white cashmere fabric. She is filled with poly-fill. Jodie wears a simple cascade pendant of gold-tone metal with white pearls. She is a ONE OF A KIND and she comes with a laminated custom hang tag that features her photo. The Blue Poet, 18.5 inches (47 cm). 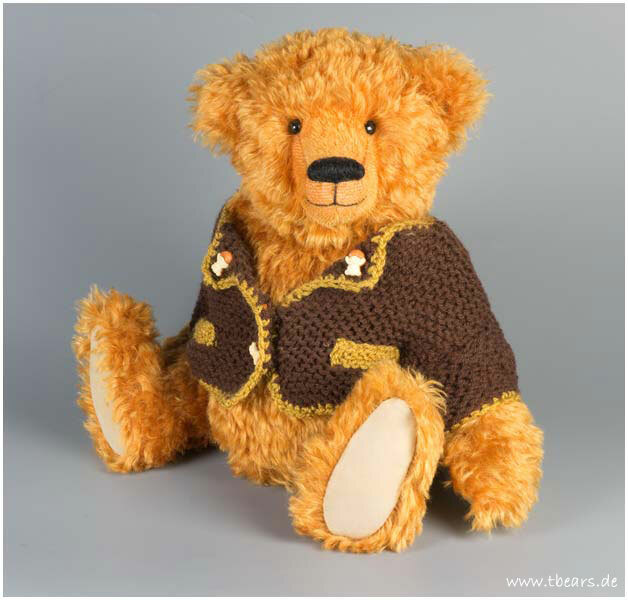 Bertram, 35 cm (13.7 inches). 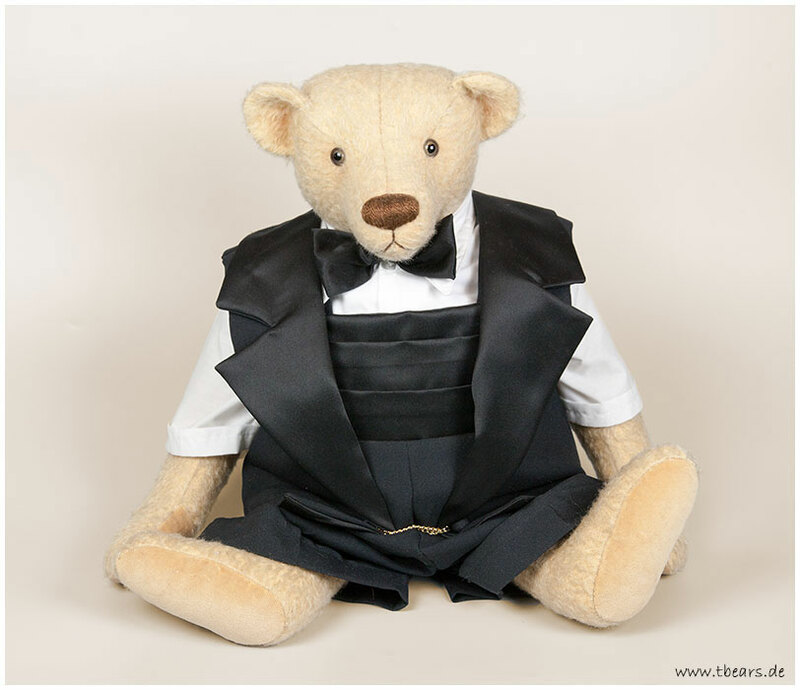 Herbert the charmer is 26 cm (10.2 inches) tall. 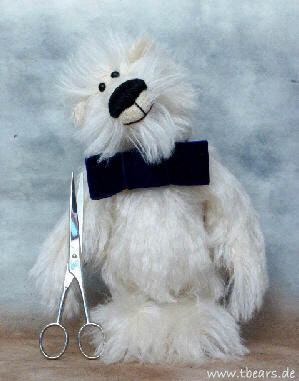 He's made of an antique viscose fabric, which is no longer available. He looks through genuine victorian shoe button eyes and has an irresistible smile. He is stuffed with polyester and pallets. I've sparsely embroidered his nose for a more aged affect. He is very hugable. 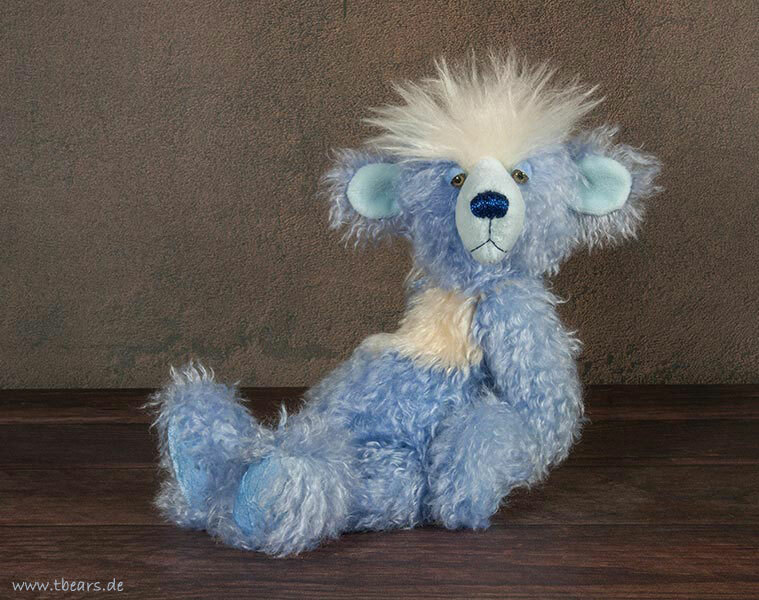 Wittgenstein is 30 cm (11.8 inches) tall. He was named after the famous philosopher Ludwig Wittgenstein. His friends call him Witt. Witt is made from a wonderful German batik woolen fabric with natural brown autumn colors. He has brown glass eyes. With his woolen eyelids, Witt looks very thoughtful, like a real philosopher. His face is softly airbrushed. Witt can stand freely. He wears his favorite forest green sweater. Andrea, 24 cm (9.5 inches). Teddy bears Fritz and Fratz are 17 cm (6.7 inches) tall. 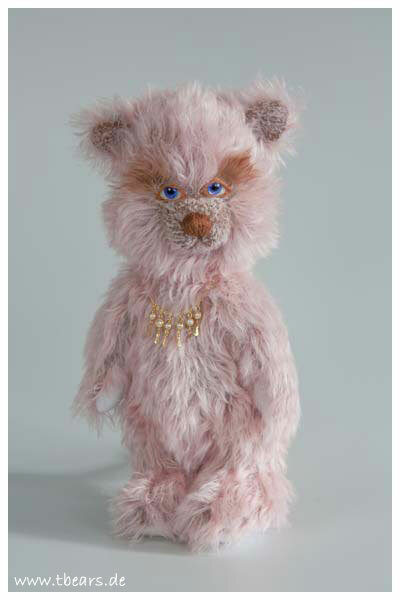 Both bears are made from Schulte Mohair and have black glass eyes. The bears are not stuffed too firmly so that they can fold her long arms. 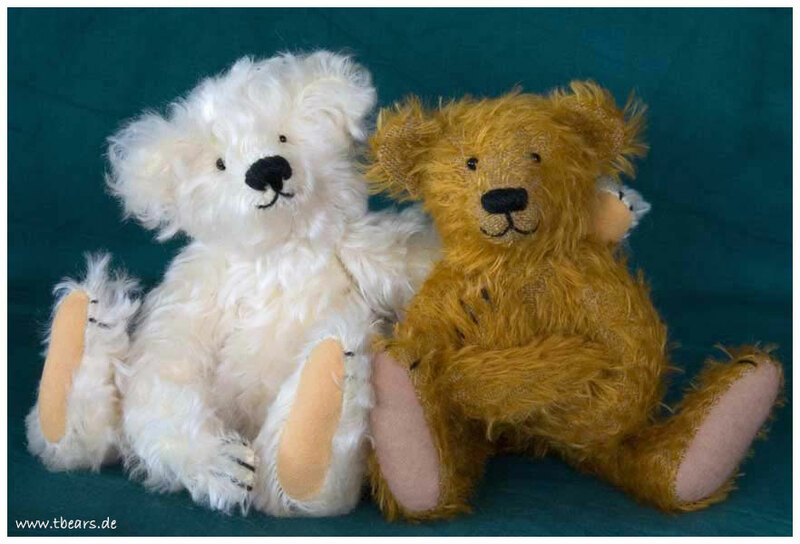 The two little pals have just the right size to sit on the palm of your hand. Teddy bear Good Old Times is 31 cm (12 inches) tall. It's my newest design which is called "vintage romance-line". 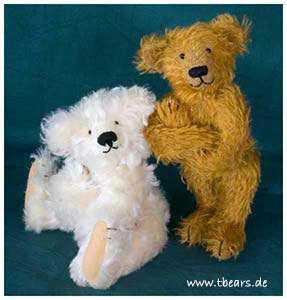 I have made the teddy bear from sparse German Schulte Mohair. The eyes are genuine victorian shoe button eyes. 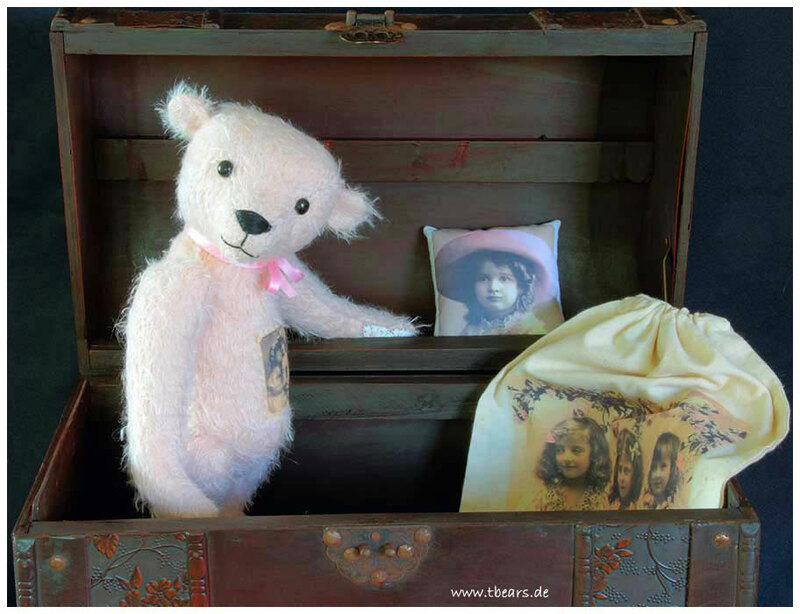 I haven't stuffed the teddy bear too tightly with synthetic fibres. 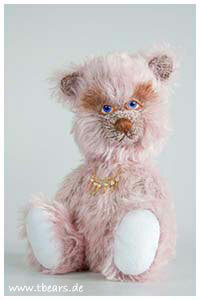 The paws are made of a cotton fabric with little red roses. 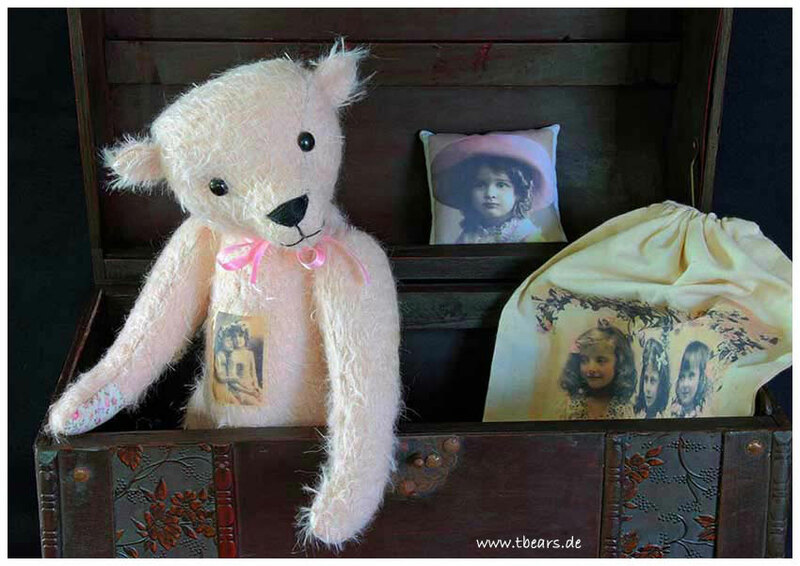 On the belly there is a stitched fabric with an over 100 year old postcard motive from young girls. The bear comes with a pillow, which has also such a sweet romantic photo on it! The bear would be fabulous tucked in a cupboard or shelf with your other antique toys and collectibles! 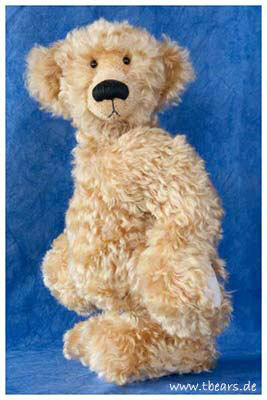 Teddy bear Ottfried is 49 cm (19.2 inches) tall. 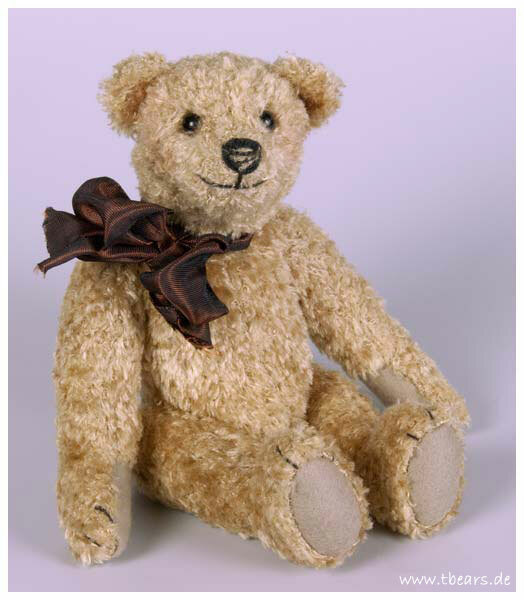 He is an other teddy bear of my "Timeless Teds"-series. He was inspired by the early Steiff bears between 1903 and 1908. 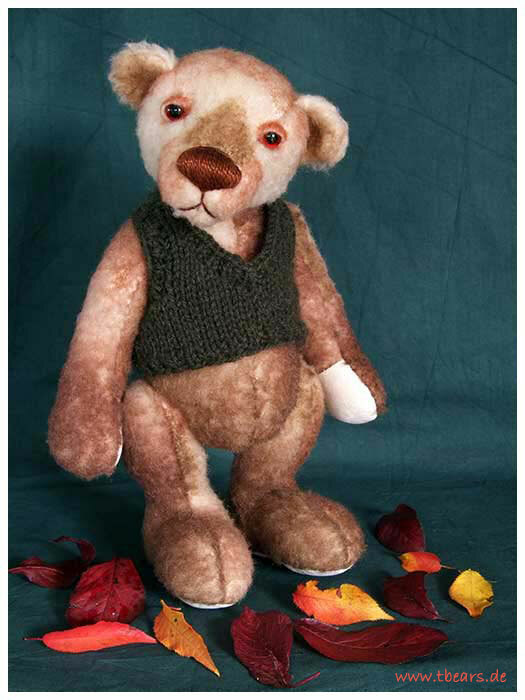 The bear has a centre seam and long arms. 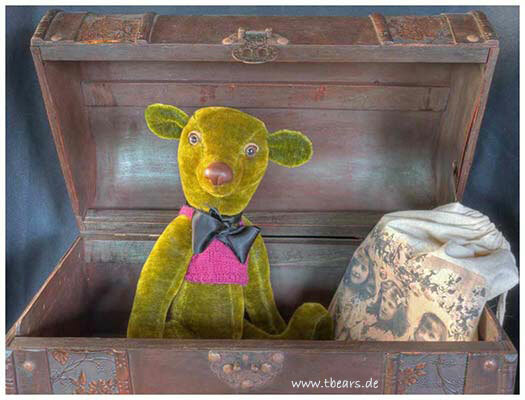 Ottfried is made from German Schulte Mohair, which has got an antique treatment. His face has soft airbrushed details. I've stitched his nose with a brown color. 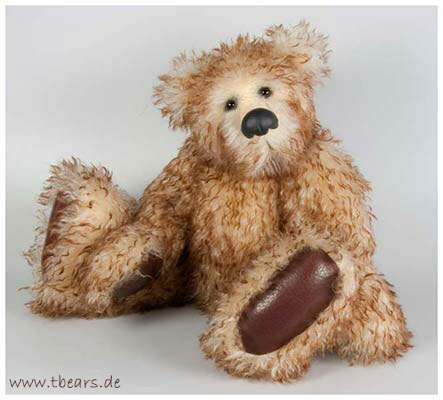 He has light brown velvet paws, tone in tone with his old looking mohair. 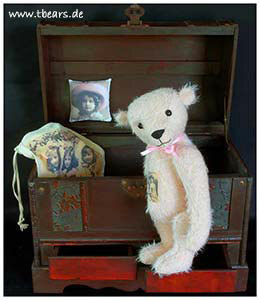 The bear is stuffed with sheep wool. He looks very old and it seems as that he was loved from generations!